"Pasteur" redirects here. For other uses, see Pasteur (disambiguation). Louis Pasteur (/ˈluːi pæˈstɜːr/, French: [lwi pastœʁ]; December 27, 1822 – September 28, 1895) was a French biologist, microbiologist and chemist renowned for his discoveries of the principles of vaccination, microbial fermentation and pasteurization. He is remembered for his remarkable breakthroughs in the causes and prevention of diseases, and his discoveries have saved many lives ever since. He reduced mortality from puerperal fever, and created the first vaccines for rabies and anthrax. His medical discoveries provided direct support for the germ theory of disease and its application in clinical medicine. He is best known to the general public for his invention of the technique of treating milk and wine to stop bacterial contamination, a process now called pasteurization. He is regarded as one of the three main founders of bacteriology, together with Ferdinand Cohn and Robert Koch, and is popularly known as the "father of microbiology". Pasteur was responsible for disproving the doctrine of spontaneous generation. He performed experiments that showed that without contamination, microorganisms could not develop. Under the auspices of the French Academy of Sciences, he demonstrated that in sterilized and sealed flasks nothing ever developed, and in sterilized but open flasks microorganisms could grow. 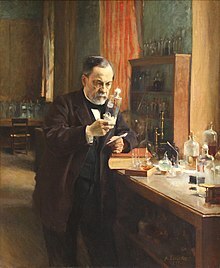 Although Pasteur was not the first to propose the germ theory, his experiments indicated its correctness and convinced most of Europe that it was true. Today, he is often regarded as one of the fathers of germ theory. Pasteur made significant discoveries in chemistry, most notably on the molecular basis for the asymmetry of certain crystals and racemization. Early in his career, his investigation of tartaric acid resulted in the first resolution of what is now called optical isomers. His work led the way to the current understanding of a fundamental principle in the structure of organic compounds. He was the director of the Pasteur Institute, established in 1887, until his death, and his body was interred in a vault beneath the institute. Although Pasteur made groundbreaking experiments, his reputation became associated with various controversies. Historical reassessment of his notebook revealed that he practiced deception to overcome his rivals. Louis Pasteur was born on December 27, 1822, in Dole, Jura, France, to a Catholic family of a poor tanner. He was the third child of Jean-Joseph Pasteur and Jeanne-Etiennette Roqui. The family moved to Marnoz in 1826 and then to Arbois in 1827. 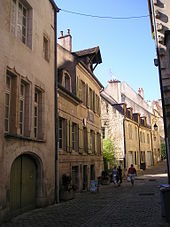 Pasteur entered primary school in 1831. He was an average student in his early years, and not particularly academic, as his interests were fishing and sketching. He drew many pastels and portraits of his parents, friends and neighbors. Pasteur attended secondary school at the Collège d'Arbois. In October 1838, he left for Paris to join the Pension Barbet, but became homesick and returned in November. In 1839, he entered the Collège Royal at Besançon to study philosophy and earned his Bachelor of Letters degree in 1840. He was appointed a tutor at the Besançon college while continuing a degree science course with special mathematics. He failed his first examination in 1841. He managed to pass the baccalauréat scientifique (general science) degree in 1842 from Dijon but with a mediocre grade in chemistry. Later in 1842, Pasteur took the entrance test for the École Normale Supérieure. He passed the first set of tests, but because his ranking was low, Pasteur decided not to continue and try again next year. He went back to the Pension Barbet to prepare for the test. He also attended classes at the Lycée Saint-Louis and lectures of Jean-Baptiste Dumas at the Sorbonne. In 1843, he passed the test with a high ranking and entered the École Normale Supérieure. In 1845 he received the licencié ès sciences (Master of Science) degree. In 1846, he was appointed professor of physics at the Collège de Tournon (now called Lycée Gabriel-Faure [fr]) in Ardèche, but the chemist Antoine Jérôme Balard wanted him back at the École Normale Supérieure as a graduate laboratory assistant (agrégé préparateur). He joined Balard and simultaneously started his research in crystallography and in 1847, he submitted his two theses, one in chemistry and the other in physics. After serving briefly as professor of physics at the Dijon Lycée in 1848, he became professor of chemistry at the University of Strasbourg, where he met and courted Marie Laurent, daughter of the university's rector in 1849. They were married on May 29, 1849, and together had five children, only two of whom survived to adulthood; the other three died of typhoid. Pasteur was appointed professor of chemistry at the University of Strasbourg in 1848, and became the chair of chemistry in 1852. In 1854, he was named dean of the new faculty of sciences at University of Lille, where he began his studies on fermentation. It was on this occasion that Pasteur uttered his oft-quoted remark: "dans les champs de l'observation, le hasard ne favorise que les esprits préparés" ("In the field of observation, chance favors only the prepared mind"). In 1857, he moved to Paris as the director of scientific studies at the École Normale Supérieure where he took control from 1858 to 1867 and introduced a series of reforms to improve the standard of scientific work. The examinations became more rigid, which led to better results, greater competition, and increased prestige. Many of his decrees, however, were rigid and authoritarian, leading to two serious student revolts. During "the bean revolt" he decreed that a mutton stew, which students had refused to eat, would be served and eaten every Monday. On another occasion he threatened to expel any student caught smoking, and 73 of the 80 students in the school resigned. In 1863, he was appointed professor of geology, physics, and chemistry at the École nationale supérieure des Beaux-Arts, a position he held until his resignation in 1867. In 1867, he became the chair of organic chemistry at the Sorbonne, but he later gave up the position because of poor health. 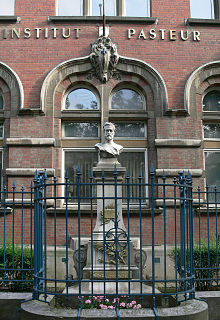 In 1867, the École Normale's laboratory of physiological chemistry was created at Pasteur's request, and he was the laboratory's director from 1867 to 1888. In Paris, he established the Pasteur Institute in 1887, in which he was its director for the rest of his life. Pasteur separated the left and right crystal shapes from each other to form two piles of crystals: in solution one form rotated light to the left, the other to the right, while an equal mixture of the two forms canceled each other's effect, and does not rotate the polarized light. In Pasteur's early work as a chemist, beginning at the École Normale Supérieure, and continuing at Strasbourg and Lille, he examined the chemical, optical and crystallographic properties of a group of compounds known as tartrates. He resolved a problem concerning the nature of tartaric acid in 1848. A solution of this compound derived from living things rotated the plane of polarization of light passing through it. The problem was that tartaric acid derived by chemical synthesis had no such effect, even though its chemical reactions were identical and its elemental composition was the same. Pasteur noticed that crystals of tartrates had small faces. Then he observed that, in racemic mixtures of tartrates, half of the crystals were right-handed and half were left-handed. In solution, the right-handed compound was dextrorotatory, and the left-handed one was levorotatory. Pasteur determined that optical activity related to the shape of the crystals, and that an asymmetric internal arrangement of the molecules of the compound was responsible for twisting the light. 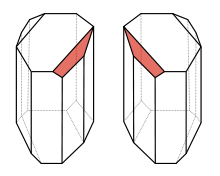 The (2R,3R)- and (2S,3S)- tartrates were isometric, non-superposable mirror images of each other. This was the first time anyone had demonstrated molecular chirality, and also the first explanation of isomerism. Some historians consider Pasteur's work in this area to be his "most profound and most original contributions to science", and his "greatest scientific discovery." Pasteur was motivated to investigate fermentation while working at Lille. In 1856 a local wine manufacturer, M. Bigot, whose son was one of Pasteur's students, sought for his advice on the problems of making beetroot alcohol and souring. According to his son-in-law, René Vallery-Radot, in August 1857 Pasteur sent a paper about lactic acid fermentation to the Société des Sciences de Lille, but the paper was read three months later. A memoire was subsequently published on November 30, 1857. In the memoir, he developed his ideas stating that: "I intend to establish that, just as there is an alcoholic ferment, the yeast of beer, which is found everywhere that sugar is decomposed into alcohol and carbonic acid, so also there is a particular ferment, a lactic yeast, always present when sugar becomes lactic acid." Pasteur also wrote about alcoholic fermentation. It was published in full form in 1858. Jöns Jacob Berzelius and Justus von Liebig had proposed the theory that fermentation was caused by decomposition. Pasteur demonstrated that this theory was incorrect, and that yeast was responsible for fermentation to produce alcohol from sugar. He also demonstrated that, when a different microorganism contaminated the wine, lactic acid was produced, making the wine sour. In 1861, Pasteur observed that less sugar fermented per part of yeast when the yeast was exposed to air. The lower rate of fermentation aerobically became known as the Pasteur effect. 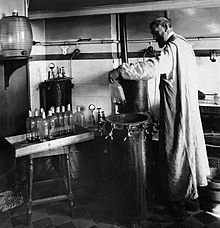 Pasteur experimenting in his laboratory. Pasteur's research also showed that the growth of micro-organisms was responsible for spoiling beverages, such as beer, wine and milk. With this established, he invented a process in which liquids such as milk were heated to a temperature between 60 and 100 °C. This killed most bacteria and moulds already present within them. Pasteur and Claude Bernard completed tests on blood and urine on April 20, 1862. Pasteur patented the process, to fight the "diseases" of wine, in 1865. The method became known as pasteurization, and was soon applied to beer and milk. Beverage contamination led Pasteur to the idea that micro-organisms infecting animals and humans cause disease. He proposed preventing the entry of micro-organisms into the human body, leading Joseph Lister to develop antiseptic methods in surgery. In 1866, Pasteur published Etudes sur le Vin, about the diseases of wine, and he published Etudes sur la Bière in 1876, concerning the diseases of beer. In the early 19th century, Agostino Bassi had shown that muscardine was caused by a fungus that infected silkworms. Since 1853, two diseases called pébrine and flacherie had been infecting great numbers of silkworms in southern France, and by 1865 they were causing huge losses to farmers. In 1865, Pasteur went to Alès and worked for five years until 1870. Silkworms with pébrine were covered in corpuscles. In the first three years, Pasteur thought that the corpuscles were a symptom of the disease. In 1870, he concluded that the corpuscles were the cause of pébrine (it is now known that the cause is a microsporidian). Pasteur also showed that the disease was hereditary. Pasteur developed a system to prevent pébrine: after the female moths laid their eggs, the moths were turned into a pulp. The pulp was examined with a microscope, and if corpuscles were observed, the eggs were destroyed. Pasteur concluded that bacteria caused flacherie. The primary cause is currently thought to be viruses. The spread of flacherie could be accidental or hereditary. Hygiene could be used to prevent accidental flacherie. Moths whose digestive cavities did not contain the microorganisms causing flacherie were used to lay eggs, preventing hereditary flacherie. Louis Pasteur’s pasteurization experiment illustrates the fact that the spoilage of liquid was caused by particles in the air rather than the air itself. These experiments were important pieces of evidence supporting the germ theory of disease. Following his fermentation experiments, Pasteur demonstrated that the skin of grapes was the natural source of yeasts, and that sterilized grapes and grape juice never fermented. He drew grape juice from under the skin with sterilized needles, and also covered grapes with sterilized cloth. Both experiments could not produce wine in sterilized containers. His findings and ideas were against the prevailing notion of spontaneous generation. He received a particularly stern criticism from Félix Archimède Pouchet, who was director of the Rouen Museum of Natural History. To settle the debate between the eminent scientists, the French Academy of Sciences offered the Alhumbert Prize carrying 2,500 francs to whoever could experimentally demonstrate for or against the doctrine. Pouchet stated that air everywhere could cause spontaneous generation of living organisms in liquids. In the late 1850s, he performed experiments and claimed that they were evidence of spontaneous generation. Francesco Redi and Lazzaro Spallanzani had provided some evidence against spontaneous generation in the 17th and 18th centuries, respectively. Spallanzani's experiments in 1765 suggested that air contaminated broths with bacteria. In the 1860s, Pasteur repeated Spallanzani's experiments, but Pouchet reported a different result using a different broth. Pasteur performed several experiments to disprove spontaneous generation. 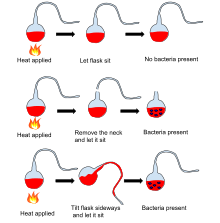 He placed boiled liquid in a flask and let hot air enter the flask. Then he closed the flask, and no organisms grew in it. In another experiment, when he opened flasks containing boiled liquid, dust entered the flasks, causing organisms to grow in some of them. The number of flasks in which organisms grew was lower at higher altitudes, showing that air at high altitudes contained less dust and fewer organisms. Pasteur also used swan neck flasks containing a fermentable liquid. Air was allowed to enter the flask via a long curving tube that made dust particles stick to it. Nothing grew in the broths unless the flasks were tilted, making the liquid touch the contaminated walls of the neck. This showed that the living organisms that grew in such broths came from outside, on dust, rather than spontaneously generating within the liquid or from the action of pure air. Never will the doctrine of spontaneous generation recover from the mortal blow of this simple experiment. There is no known circumstance in which it can be confirmed that microscopic beings came into the world without germs, without parents similar to themselves. Pasteur's later work on diseases included work on chicken cholera. He received cultures from Jean Joseph Henri Toussaint, and cultivated them in chicken broth. During this work, a culture of the responsible bacteria had spoiled and failed to induce the disease in some chickens he was infecting with the disease. Upon reusing these healthy chickens, Pasteur discovered he could not infect them, even with fresh bacteria; the weakened bacteria had caused the chickens to become immune to the disease, though they had caused only mild symptoms. In 1879, his assistant, Charles Chamberland (of French origin), had been instructed to inoculate the chickens after Pasteur went on holiday. Chamberland failed to do this and went on holiday himself. On his return, the month-old cultures made the chickens unwell, but instead of the infections being fatal, as they usually were, the chickens recovered completely. Chamberland assumed an error had been made, and wanted to discard the apparently faulty culture, but Pasteur stopped him. He inoculated the chickens with virulent bacteria that killed other chickens, and they survived. Pasteur concluded that the animals were now immune to the disease. In December 1879, Pasteur used a weakened culture of the bacteria to inoculate chickens. The chickens survived, and when he inoculated them with a virulent strain, they were immune to it. In 1880, Pasteur presented his results to the French Academy of Sciences, saying that the bacteria were weakened by contact with oxygen. In the 1870s, he applied this immunization method to anthrax, which affected cattle, and aroused interest in combating other diseases. Pasteur cultivated bacteria from the blood of animals infected with anthrax. When he inoculated animals with the bacteria, anthrax occurred, proving that the bacteria was the cause of the disease. Many cattle were dying of anthrax in "cursed fields". Pasteur was told that sheep that died from anthrax were buried in the field. Pasteur thought that earthworms might have brought the bacteria to the surface. He found anthrax bacteria in earthworms' excrement, showing that he was correct. He told the farmers not to bury dead animals in the fields. In 1880, Pasteur's rival Jean-Joseph-Henri Toussaint, a veterinary surgeon, used carbolic acid to kill anthrax bacilli and tested the vaccine on sheep. Pasteur thought that this type of killed vaccine should not work because he believed that attenuated bacteria used up nutrients that the bacteria needed to grow. He thought oxidizing bacteria made them less virulent. In early 1881, Pasteur discovered that growing anthrax bacilli at about 42 °C made them unable to produce spores, and he described this method in a speech to the French Academy of Sciences on February 28. Later in 1881, veterinarian Hippolyte Rossignol proposed that the Société d'agriculture de Melun organize an experiment to test Pasteur's vaccine. Pasteur agreed, and the experiment, conducted at Pouilly-le-Fort on sheep, goats and cows, was successful. Pasteur did not directly disclose how he prepared the vaccines used at Pouilly-le-Fort. His laboratory notebooks, now in the Bibliothèque Nationale in Paris, show that he actually used heat and potassium dichromate, similar to Toussaint's method. The notion of a weak form of a disease causing immunity to the virulent version was not new; this had been known for a long time for smallpox. Inoculation with smallpox (variolation) was known to result in a much less severe disease, and greatly reduced mortality, in comparison with the naturally acquired disease. Edward Jenner had also studied vaccination using cowpox (vaccinia) to give cross-immunity to smallpox in the late 1790s, and by the early 1800s vaccination had spread to most of Europe. The difference between smallpox vaccination and anthrax or chicken cholera vaccination was that the latter two disease organisms had been artificially weakened, so a naturally weak form of the disease organism did not need to be found. This discovery revolutionized work in infectious diseases, and Pasteur gave these artificially weakened diseases the generic name of "vaccines", in honour of Jenner's discovery. In 1876, Robert Koch had shown that Bacillus anthracis caused anthrax. In his papers published between 1878 and 1880, Pasteur only mentioned Koch's work in a footnote. Koch met Pasteur at the Seventh International Medical Congress in 1881. A few months later, Koch wrote that Pasteur had used impure cultures and made errors. In 1882, Pasteur replied to Koch in a speech, to which Koch responded aggressively. Koch stated that Pasteur tested his vaccine on unsuitable animals and that Pasteur's research was not properly scientific. In 1882, Koch wrote "On the Anthrax Inoculation", in which he refuted several of Pasteur's conclusions about anthrax and criticized Pasteur for keeping his methods secret, jumping to conclusions, and being imprecise. In 1883, Pasteur wrote that he used cultures prepared in a similar way to his successful fermentation experiments and that Koch misinterpreted statistics and ignored Pasteur's work on silkworms. In 1882, Pasteur sent his assistant Louis Thuillier to southern France because of an epizootic of swine erysipelas. Thuillier identified the bacillus that caused the disease in March 1883. Pasteur and Thuillier increased the bacillus's virulence after passing it through pigeons. Then they passed the bacillus through rabbits, weakening it and obtaining a vaccine. Pasteur and Thuillier incorrectly described the bacterium as a figure-eight shape. Roux described the bacterium as stick-shaped in 1884. Pasteur produced the first vaccine for rabies by growing the virus in rabbits, and then weakening it by drying the affected nerve tissue. 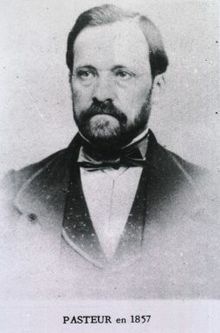 The rabies vaccine was initially created by Emile Roux, a French doctor and a colleague of Pasteur, who had produced a killed vaccine using this method. The vaccine had been tested in 50 dogs before its first human trial. This vaccine was used on 9-year-old Joseph Meister, on July 6, 1885, after the boy was badly mauled by a rabid dog. This was done at some personal risk for Pasteur, since he was not a licensed physician and could have faced prosecution for treating the boy. After consulting with physicians, he decided to go ahead with the treatment. Over 11 days, Meister received 13 inoculations, each inoculation using viruses that had been weakened for a shorter period of time. Three months later he examined Meister and found that he was in good health. Pasteur was hailed as a hero and the legal matter was not pursued. Analysis of his laboratory notebooks shows that Pasteur had treated two people before his vaccination of Meister. One survived but may not actually have had rabies, and the other died of rabies. Pasteur began treatment of Jean-Baptiste Jupille on October 20, 1885, and the treatment was successful. Later in 1885, people, including four children from the United States, went to Pasteur's laboratory to be inoculated. In 1886, he treated 350 people, of which only one developed rabies. The treatment's success laid the foundations for the manufacture of many other vaccines. The first of the Pasteur Institutes was also built on the basis of this achievement. Pasteur himself was absolutely fearless. Anxious to secure a sample of saliva straight from the jaws of a rabid dog, I once saw him with the glass tube held between his lips draw a few drops of the deadly saliva from the mouth of a rabid bull-dog, held on the table by two assistants, their hands protected by leather gloves. Because of his study in germs, Pasteur encouraged doctors to sanitize their hands and equipment before surgery. Prior to this, few doctors or their assistants practiced these procedures. A French national hero at age 55, in 1878 Pasteur discreetly told his family never to reveal his laboratory notebooks to anyone. His family obeyed, and all his documents were held and inherited in secrecy. Finally, in 1964 Pasteur's grandson and last surviving male descendant, Pasteur Valley-Radot, donated the papers to the French national library (Bibliothèque nationale de France). Yet the papers were restricted for historical studies until the death of Valley-Radot in 1971. The documents were given a catalogue number only in 1985. In 1995, the centennial of the death of Louis Pasteur, a historian of science Gerald L. Geison published an analysis of Pasteur's private notebooks in his The Private Science of Louis Pasteur, and declared that Pasteur had given several misleading accounts and played deceptions in his most important discoveries. Max Perutz published a defense of Pasteur in The New York Review of Books. Based on further examinations of Pasteur's documents, French immunologist Patrice Debré concluded in his book Louis Pasteur (1998) that in spite of his genius, Pasteur had some faults. A book review states that Debré "sometimes finds him unfair, combative, arrogant, unattractive in attitude, inflexible and even dogmatic". Scientists before Pasteur had studied fermentation. In the 1830s, Charles Cagniard-Latour, Friedrich Traugott Kützing and Theodor Schwann used microscopes to study yeasts and concluded that yeasts were living organisms. In 1839, Justus von Liebig, Friedrich Wöhler and Jöns Jacob Berzelius stated that yeast was not an organism and was produced when air acted on plant juice. In 1855, Antoine Béchamp, Professor of Chemistry at the University of Montpellier, conducted experiments with sucrose solutions and concluded that water was the factor for fermentation. He changed his conclusion in 1858, stating that fermentation was directly related to the growth of moulds, which required air for growth. He regarded himself as the first to show the role of microorganisms in fermentation. Pasteur started his experiments in 1857 and published his findings in 1858 (April issue of Comptes Rendus Chimie, Béchamp's paper appeared in January issue). Béchamp noted that Pasteur did not bring any novel idea or experiments. On the other hand, Béchamp was probably aware of Pasteur's 1857 preliminary works. With both scientists claiming priority on the discovery, a dispute, extending to several areas, lasted throughout their lives. However, Béchamp was on the losing side, as the BMJ obituary remarked: His name was "associated with bygone controversies as to priority which it would be unprofitable to recall". Béchamp proposed the incorrect theory of microzymes. According to K. L. Manchester, anti-vivisectionists and proponents of alternative medicine promoted Béchamp and microzymes, unjustifiably claiming that Pasteur plagiarized Béchamp. Pasteur thought that succinic acid inverted sucrose. In 1860, Marcellin Berthelot isolated invertase and showed that succinic acid did not invert sucrose. Pasteur believed that fermentation was only due to living cells. Hans Buchner discovered that zymase catalyzed fermentation, showing that fermentation was catalyzed by enzymes within cells. Eduard Buchner also discovered that fermentation could take place outside living cells. Pasteur publicly claimed his success in developing the anthrax vaccine in 1881. However, his admirer-turned-rival Toussaint was the one who developed the first vaccine. Toussaint isolated the bacteria that caused chicken cholera (later named Pasteurella in honour of Pasteur) in 1879 and gave samples to Pasteur who used them for his own works. On July 12, 1880, Toussaint presented his successful result to the French Academy of Sciences, using an attenuated vaccine against anthrax in dogs and sheep. Pasteur on grounds of jealousy contested the discovery by publicly displaying his vaccination method at Pouilly-le-Fort on May 5, 1881. Pasteur gave a misleading account of the preparation of the anthrax vaccine used in the experiment at Pouilly-le-Fort. He used potassium dichromate to prepare the vaccine. The promotional experiment was a success and helped Pasteur sell his products, getting the benefits and glory. Pasteur experiments are often cited as against medical ethics, especially on his vaccination of Meister. He did not have any experience in medical practice, and more importantly, a medical license. This is often cited as a serious threat to his professional and personal reputation. His closest partner Émile Roux, who had medical qualifications, refused to participate in the clinical trial, likely because he considered it unjust. However, Pasteur executed vaccination of the boy under the close watch of practising physicians Jacques-Joseph Grancher, head of the Paris Children's Hospital's paediatric clinic, and Alfred Vulpian, a member of the Commission on Rabies. He was not allowed to hold the syringe, although the inoculations were entirely under his supervision. It was Grancher who was responsible for the injections, and he defended Pasteur before the French National Academy of Medicine in the issue. Pasteur has also been criticized for keeping secrecy of his procedure and not giving proper pre-clinical trials on animals. Pasteur stated that he kept his procedure secret in order to control its quality. He later disclosed his procedures to a small group of scientists. Pasteur wrote that he had successfully vaccinated 50 rabid dogs before using it on Meister. According to Geison, Pasteur's laboratory notebooks show that he had vaccinated only 11 dogs. Meister never showed any symptoms of rabies, but the vaccination has not been proved to be the reason. One source estimates the probability of Meister contracting rabies at 10%. Pasteur was awarded 1,500 francs in 1853 by the Pharmaceutical Society for the synthesis of racemic acid. In 1856 the Royal Society of London presented him the Rumford Medal for his discovery of the nature of racemic acid and its relations to polarized light, and the Copley Medal in 1874 for his work on fermentation. He was elected a Foreign Member of the Royal Society (ForMemRS) in 1869. The French Academy of Sciences awarded Pasteur the 1859 Montyon Prize for experimental physiology in 1860, and the Jecker Prize in 1861 and the Alhumbert Prize in 1862 for his experimental refutation of spontaneous generation. Though he lost elections in 1857 and 1861 for membership to the French Academy of Sciences, he won the 1862 election for membership to the mineralogy section. He was elected to permanent secretary of the physical science section of the academy in 1887 and held the position until 1889. 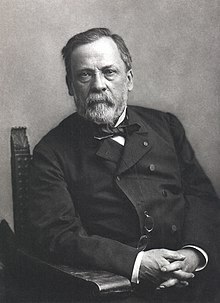 In 1873 Pasteur was elected to the Académie Nationale de Médecine and was made the commander in the Brazilian Order of the Rose. In 1881 he was elected to a seat at the Académie française left vacant by Émile Littré. Pasteur received the Albert Medal from the Royal Society of Arts in 1882. In 1883 he became foreign member of the Royal Netherlands Academy of Arts and Sciences. On June 8, 1886, the Ottoman Sultan Abdul Hamid II awarded Pasteur with the Order of the Medjidie (I Class) and 10000 Ottoman liras. Pasteur won the Leeuwenhoek Medal from the Royal Netherlands Academy of Arts and Sciences for his contributions to microbiology in 1895. Pasteur was made a Chevalier of the Legion of Honour in 1853, promoted to Officer in 1863, to Commander in 1868, to Grand Officer in 1878 and made a Grand Cross of the Legion of Honor in 1881. In many localities worldwide, streets are named in his honor. For example, in the US: Palo Alto and Irvine, California, Boston and Polk, Florida, adjacent to the University of Texas Health Science Center at San Antonio; Jonquière, Québec; San Salvador de Jujuy and Buenos Aires (Argentina), Great Yarmouth in Norfolk, in the United Kingdom, Jericho and Wulguru in Queensland, (Australia); Phnom Penh in Cambodia; Ho Chi Minh City; Batna in Algeria; Bandung in Indonesia, Tehran in Iran, near the central campus of the Warsaw University in Warsaw, Poland; adjacent to the Odessa State Medical University in Odessa, Ukraine; Milan in Italy and Bucharest, Cluj-Napoca and Timișoara in Romania. The Avenue Pasteur in Saigon, Vietnam, is one of the few streets in that city to retain its French name. Avenue Louis Pasteur in the Longwood Medical and Academic Area in Boston, Massachusetts was named in his honor in the French manner with "Avenue" preceding the name of the dedicatee. Both the Institute Pasteur and Université Louis Pasteur were named after Pasteur. The schools Lycée Pasteur in Neuilly-sur-Seine, France, and Lycée Louis Pasteur in Calgary, Alberta, Canada, are named after him. In South Africa, the Louis Pasteur Private Hospital in Pretoria, and Life Louis Pasteur Private Hospital, Bloemfontein, are named after him. Louis Pasteur University Hospital in Košice, Slovakia is also named after Pasteur. A statue of Pasteur is erected at San Rafael High School in San Rafael, California. A bronze bust of him resides on the French Campus of Kaiser Permanente's San Francisco Medical Center in San Francisco. The sculpture was designed by Harriet G. Moore and cast in 1984 by Artworks Foundry. The UNESCO/Institut Pasteur Medal was created on the centenary of Pasteur's death, and is given every two years in his name, "in recognition of outstanding research contributing to a beneficial impact on human health". After developing the rabies vaccine, Pasteur proposed an institute for the vaccine. In 1887, fundraising for the Pasteur Institute began, with donations from many countries. The official statute was registered in 1887, stating that the institute's purposes were "the treatment of rabies according to the method developed by M. Pasteur" and "the study of virulent and contagious diseases". The institute was inaugurated on November 14, 1888. He brought together scientists with various specialties. The first five departments were directed by two graduates of the École Normale Supérieure: Émile Duclaux (general microbiology research) and Charles Chamberland (microbe research applied to hygiene), as well as a biologist, Élie Metchnikoff (morphological microbe research) and two physicians, Jacques-Joseph Grancher (rabies) and Émile Roux (technical microbe research). One year after the inauguration of the institute, Roux set up the first course of microbiology ever taught in the world, then entitled Cours de Microbie Technique (Course of microbe research techniques). Since 1891 the Pasteur Institute had been extended to different countries, and currently there are 32 institutes in 29 countries in various parts of the world. Absolute faith in God and in Eternity, and a conviction that the power for good given to us in this world will be continued beyond it, were feelings which pervaded his whole life; the virtues of the gospel had ever been present to him. Full of respect for the form of religion which had been that of his forefathers, he came simply to it and naturally for spiritual help in these last weeks of his life. Maurice Vallery-Radot, grandson of the brother of the son-in-law of Pasteur and outspoken Catholic, also holds that Pasteur fundamentally remained Catholic. According to both Pasteur Vallery-Radot and Maurice Vallery-Radot, the following well-known quotation attributed to Pasteur is apocryphal: "The more I know, the more nearly is my faith that of the Breton peasant. Could I but know all I would have the faith of a Breton peasant's wife". According to Maurice Vallery-Radot, the false quotation appeared for the first time shortly after the death of Pasteur. However, despite his belief in God, it has been said that his views were that of a freethinker rather than a Catholic, a spiritual more than a religious man. He was also against mixing science with religion. In 1868, Pasteur suffered a severe brain stroke that paralysed the left side of his body, but he recovered. A stroke or uremia in 1894 severely impaired his health. Failing to fully recover, he died on September 28, 1895, near Paris. He was given a state funeral and was buried in the Cathedral of Notre Dame, but his remains were reinterred in the Pasteur Institute in Paris, in a vault covered in depictions of his accomplishments in Byzantine mosaics. The standard author abbreviation Pasteur is used to indicate this person as the author when citing a botanical name. ^ a b "Fellows of the Royal Society". London: Royal Society. Archived from the original on March 16, 2015. ^ "II. Abdülhamid'in Fransız kimyagere yaptığı yardım ortaya çıktı". CNN Türk. Retrieved December 29, 2016. ^ a b c d e f James J. Walsh (1913). "Louis Pasteur" . In Herbermann, Charles (ed.). Catholic Encyclopedia. New York: Robert Appleton Company. ^ a b Feinstein, S (2008). Louis Pasteur: The Father of Microbiology. Enslow Publishers, Inc. pp. 1–128. ISBN 978-1-59845-078-1. ^ a b c d Hook, Sue Vander (2011). Louis Pasteur: Groundbreaking Chemist & Biologist. Minnesota: ABDO Publishing Company. pp. 8–112. ISBN 978-1-61758-941-6. ^ a b c Ullmann, Agnes (August 2007). "Pasteur-Koch: Distinctive Ways of Thinking about Infectious Diseases". Microbe. 2 (8): 383–387. Retrieved December 12, 2007. ^ a b c Geison, Gerald L (1995). The Private Science of Louis Pasteur. Princeton, NJ: Princeton university press. ISBN 978-0-691-01552-1. ^ Anderson, C. (1993). "Pasteur Notebooks Reveal Deception". Science. 259 (5098): 1117. doi:10.1126/science.259.5098.1117-a. PMID 8438162. ^ Debré, Patrice (2000). Louis Pasteur. Translated by Forster, Elborg. Baltimore: JHU Press. pp. 6–7. ISBN 978-0-8018-6529-9. ^ Robbins, Louise (2001). Louis Pasteur and the Hidden World of Microbes. New York: Oxford University Press. p. 14. ISBN 978-0-19-512227-5. ^ Debré, Patrice (2000). Louis Pasteur. Translated by Forster, Elborg. Baltimore: JHU Press. p. 8. ISBN 978-0-8018-6529-9. ^ Debré, Patrice (2000). Louis Pasteur. Translated by Forster, Elborg. Baltimore: JHU Press. pp. 12–13. ISBN 978-0-8018-6529-9. ^ Robbins, Louise (2001). Louis Pasteur and the Hidden World of Microbes. New York: Oxford University Press. p. 15. ISBN 978-0-19-512227-5. ^ Debré, Patrice (2000). Louis Pasteur. Translated by Forster, Elborg. Baltimore: JHU Press. pp. 11–12. ISBN 978-0-8018-6529-9. ^ Keim, Albert; Lumet, Louis (1914). Louis Pasteur. Frederick A. Stokes Company. pp. 10, 12. ^ Debré, Patrice (2000). Louis Pasteur. Translated by Forster, Elborg. Baltimore: JHU Press. pp. 14, 17. ISBN 978-0-8018-6529-9. ^ Debré, Patrice (2000). Louis Pasteur. Translated by Forster, Elborg. Baltimore: JHU Press. pp. 19–20. ISBN 978-0-8018-6529-9. ^ Robbins, Louise (2001). Louis Pasteur and the Hidden World of Microbes. New York: Oxford University Press. p. 18. ISBN 978-0-19-512227-5. ^ Debré, Patrice (2000). Louis Pasteur. Translated by Forster, Elborg. Baltimore: JHU Press. pp. 20–21. ISBN 978-0-8018-6529-9. ^ Keim, Albert; Lumet, Louis (1914). Louis Pasteur. Frederick A. Stokes Company. pp. 15–17. ^ Debré, Patrice (2000). Louis Pasteur. Translated by Forster, Elborg. Baltimore: JHU Press. pp. 23–24. ISBN 978-0-8018-6529-9. ^ a b Debré, Patrice (2000). Louis Pasteur. Translated by Forster, Elborg. Baltimore: JHU Press. p. 502. ISBN 978-0-8018-6529-9. ^ Debré, Patrice (2000). Louis Pasteur. Translated by Forster, Elborg. Baltimore: JHU Press. pp. 29–30. ISBN 978-0-8018-6529-9. ^ Keim, Albert; Lumet, Louis (1914). Louis Pasteur. Frederick A. Stokes Company. pp. 28–29. ^ Keim, Albert; Lumet, Louis (1914). Louis Pasteur. Frederick A. Stokes Company. pp. 37–38. ^ Holmes, Samuel J. (1924). Louis Pasteur. Harcourt, Brace and company. pp. 34–36. ^ Robbins, Louise E. (2001). Louis Pasteur and the Hidden World of Microbes. Oxford University Press. p. 56. ISBN 978-0-19-028404-6. ^ Debré, Patrice (2000). Louis Pasteur. Translated by Forster, Elborg. Baltimore: JHU Press. pp. 502–503. ISBN 978-0-8018-6529-9. ^ a b "Louis Pasteur". Science History Institute. June 2016. Retrieved March 20, 2018. ^ L. Pasteur, "Discours prononcé à Douai, le 7 décembre 1854, à l'occasion de l'installation solennelle de la Faculté des lettres de Douai et de la Faculté des sciences de Lille" (Speech delivered at Douai on December 7, 1854 on the occasion of his formal inauguration to the Faculty of Letters of Douai and the Faculty of Sciences of Lille), reprinted in: Pasteur Vallery-Radot, ed., Oeuvres de Pasteur (Paris, France: Masson and Co., 1939), vol. 7, p. 131. ^ Debré, Patrice (2000). Louis Pasteur. Translated by Elborg Forster. Baltimore: Johns Hopkins University Press. pp. 119–120. ISBN 978-0-8018-6529-9. Retrieved January 27, 2015. ^ a b c Debré, Patrice (2000). Louis Pasteur. Translated by Forster, Elborg. Baltimore: JHU Press. pp. 505–507. ISBN 978-0-8018-6529-9. ^ Vallery-Radot, René (1919). The Life of Pasteur. Translated by Devonshire, R. L. London: Constable & Company. p. 246. ^ Heilbron, J. L., ed. (2003). "Pasteur, Louis". The Oxford Companion to the History of Modern Science. Oxford University Press. p. 617. ISBN 978-0-19-974376-6. ^ a b c d e H.D. Flack (2009) "Louis Pasteur's discovery of molecular chirality and spontaneous resolution in 1848, together with a complete review of his crystallographic and chemical work," Acta Crystallographica, Section A, vol. 65, pp. 371–389. ^ L. Pasteur (1848) "Mémoire sur la relation qui peut exister entre la forme cristalline et la composition chimique, et sur la cause de la polarisation rotatoire" (Memoir on the relationship that can exist between crystalline form and chemical composition, and on the cause of rotary polarization)," Comptes rendus de l'Académie des sciences (Paris), 26 : 535–538. ^ L. Pasteur (1848) "Sur les relations qui peuvent exister entre la forme cristalline, la composition chimique et le sens de la polarisation rotatoire" (On the relations that can exist between crystalline form, and chemical composition, and the sense of rotary polarization), Annales de Chimie et de Physique, 3rd series, vol. 24, no. 6, pp. 442–459. ^ George B. Kauffman and Robin D. Myers (1998)"Pasteur's resolution of racemic acid: A sesquicentennial retrospect and a new translation," The Chemical Educator, vol. 3, no. 6,[page needed]. ^ Joseph Gal: Louis Pasteur, Language, and Molecular Chirality. I. Background and Dissymmetry, Chirality 23 (2011) 1−16. ^ a b c d e Cohn, David V (December 18, 2006). "Pasteur". University of Louisville. Retrieved December 2, 2007. Fortunately, Pasteur's colleagues Chamberlain [sic] and Roux followed up the results of a research physician Jean-Joseph-Henri Toussaint, who had reported a year earlier that carbolic-acid/heated anthrax serum would immunize against anthrax. These results were difficult to reproduce and discarded although, as it turned out, Toussaint had been on the right track. This led Pasteur and his assistants to substitute an anthrax vaccine prepared by a method similar to that of Toussaint and different from what Pasteur had announced. ^ Vallery-Radot, René (1919). The Life of Pasteur. Translated by Devonshire, R. L. London: Constable & Company. p. 79. ^ a b c d e f g h i j Ligon, B. Lee (2002). "Biography: Louis Pasteur: A controversial figure in a debate on scientific ethics". Seminars in Pediatric Infectious Diseases. 13 (2): 134–141. doi:10.1053/spid.2002.125138. ^ Vallery-Radot, René (1907). La vie de Pasteur (in French). Paris: Librairie Hachette. p. 98. ^ Pasteur, Louis (1857). "Mémoire sur la fermentation appelée lactique". Comptes Rendus Chimie (in French). 45: 913–916. ^ a b c Manchester, K.L. (2007). "Louis Pasteur, fermentation, and a rival". South African Journal of Science. 103 (9–10): 377–380. ^ Pasteur, Louis (1857). "Mémoire sur la fermentation alcoolique". Comptes Rendus Chimie (in French). 45 (6): 1032–1036. PMC 2229983. ^ Pasteur, Louis (1858). "Nouveaux faits concernant l'histoire de la fermentation alcoolique". Comptes Rendus Chimie (in French). 47: 1011–1013. ^ Pasteur, Louis (1858). "Nouveaux faits concernant l'histoire de la fermentation alcoolique". Annales de Chimie et de Physique. 3rd Series (in French). 52: 404–418. ^ a b c d e Barnett, James A.; Barnett, Linda (2011). Yeast Research : A Historical Overview. Washington, DC: ASM Press. ISBN 978-1-55581-516-5. ^ Zimmermann, F.K. ; Entian, K.-D., eds. (1997). Yeast Sugar Metabolism. CRC Press. pp. 20–21. ISBN 978-1-56676-466-7. ^ a b Bowden, Mary Ellen; Crow, Amy Beth; Sullivan, Tracy (2003). Pharmaceutical achievers : the human face of pharmaceutical research. Philadelphia: Chemical Heritage Press. ISBN 978-0-941901-30-7. ^ Vallery-Radot, René (1919). The Life of Pasteur. Translated by Devonshire, R.L. London: Constable & Company. p. 104. ^ Nelson, Bryn (2009). "The Lingering Heat over Pasteurized Milk". Chemical Heritage Magazine. 27 (1). Retrieved March 20, 2018. ^ Hicks, Jesse. "A Fresh Breath". Chemical Heritage Magazine. Archived from the original on June 11, 2016. Retrieved January 27, 2015. ^ a b c Hatcher, Paul; Battey, Nick (2011). Biological Diversity: Exploiters and Exploited. John Wiley & Sons. pp. 88–89, 91. ISBN 978-0-470-97986-0. ^ a b c Berche, P. (2012). "Louis Pasteur, from crystals of life to vaccination". Clinical Microbiology and Infection. 18 (s5): 1–6. doi:10.1111/j.1469-0691.2012.03945.x. PMID 22882766. ^ a b c d e Schwartz, M. (2001). "The life and works of Louis Pasteur". Journal of Applied Microbiology. 91 (4): 597–601. doi:10.1046/j.1365-2672.2001.01495.x. PMID 11576293. ^ a b Keim, Albert; Lumet, Louis (1914). Louis Pasteur. Frederick A. Stokes Company. pp. 87–88. ^ Vallery-Radot, René (1919). The Life of Pasteur. Translated by Devonshire, R. L. London: Constable & Company. p. 141. ^ Vallery-Radot, René (1919). The Life of Pasteur. Translated by Devonshire, R. L. London: Constable & Company. p. 156. ^ a b Magner, Lois N. (2002). History of the Life Sciences (3 ed.). New York: Marcel Dekker. pp. 251–252. ISBN 978-0-203-91100-6. ^ Roll-Hansen, Nils (1979). "Experimental Method and Spontaneous Generation: The Controversy between Pasteur and Pouchet, 1859–64". Journal of the History of Medicine and Allied Sciences. XXXIV (3): 273–292. doi:10.1093/jhmas/XXXIV.3.273. PMID 383780. ^ Farley, J; Geison, GL (1974). "Science, politics and spontaneous generation in nineteenth-century France: the Pasteur-Pouchet debate". Bulletin of the History of Medicine. 48 (2): 161–198. PMID 4617616. ^ Keim, Albert; Lumet, Louis (1914). Louis Pasteur. Frederick A. Stokes Company. p. 64. ^ a b c d Porter, JR (1961). "Louis Pasteur: achievements and disappointments, 1861". Bacteriological Reviews. 25: 389–403. PMC 441122. PMID 14037390. ^ Vallery-Radot, René (1919). The Life of Pasteur. Translated by Devonshire, R. L. London: Constable & Company. pp. 96–98. ^ Keim, Albert; Lumet, Louis (1914). Louis Pasteur. Frederick A. Stokes Company. pp. 63–67. ^ a b Plotkin, Stanley A., ed. (2011). History of Vaccine Development. Springer. pp. 35–36. ISBN 978-1-4419-1339-5. ^ Dixon, Bernard (1980). "The hundred years of Louis Pasteur". New Scientist. No. 1221. Reed Business Information. pp. 30–32. ^ Sternberg, George M. (1901). A Textbook of Bacteriology. New York: William Wood and Company. pp. 278–279. ^ Artenstein, Andrew W., ed. (2009). Vaccines: A Biography. Springer. p. 75. ISBN 978-1-4419-1108-7. ^ Keim, Albert; Lumet, Louis (1914). Louis Pasteur. Frederick A. Stokes Company. pp. 123–125. ^ Vallery-Radot, René (1919). The Life of Pasteur. Translated by Devonshire, R. L. London: Constable & Company. pp. 303–305. ^ Tizard, Ian (1998). "Grease, Anthraxgate, and Kennel Cough: A Revisionist History of Early Veterinary Vaccines". In Schultz, Ronald D. (ed.). Veterinary Vaccines and Diagnostics. Academic Press. pp. 12–14. ISBN 978-0-08-052683-6. ^ a b Bazin, Hervé (2011). Vaccinations: a History: From Lady Montagu to Jenner and genetic engineering. John Libbey Eurotext. pp. 196–197. ISBN 978-2-7420-1344-9. ^ Pasteur, L.; Chamberland, C.; Roux, E. (1881). "Le vaccin de charbon". Comptes Rendus Hebdomadaires des Séances de l'Académie des Sciences (in French). 92: 666–668. ^ Plotkin, Stanley A., ed. (2011). History of Vaccine Development. Springer. pp. 37–38. ISBN 978-1-4419-1339-5. ^ a b c Giese, Matthias, ed. (2013). Molecular Vaccines: From Prophylaxis to Therapy. 1. Springer. p. 4. ISBN 978-3-7091-1419-3. ^ Loir, A (1938). "A l'ombre de Pasteur". Le mouvement sanitaire. pp. 18, 160. ^ Artenstein, Andrew W., ed. (2009). Vaccines: A Biography. Springer. p. 10. ISBN 978-1-4419-1108-7. ^ Bazin, Hervé (2011). Vaccinations: a History: From Lady Montagu to Jenner and genetic engineering. John Libbey Eurotext. pp. 66–67, 82. ISBN 978-2-7420-1344-9. ^ Vallery-Radot, René (1919). The Life of Pasteur. Translated by Devonshire, R. L. London: Constable & Company. p. 332. ^ a b De Paolo, Charles (2006). Epidemic Disease and Human Understanding: A Historical Analysis of Scientific and Other Writings. McFarland. pp. 103, 111–114. ISBN 978-0-7864-2506-8. ^ Plotkin, Stanley A., ed. (2011). History of Vaccine Development. Springer. p. 39. ISBN 978-1-4419-1339-5. ^ Bazin, Hervé (2011). Vaccination: A History. John Libbey Eurotext. p. 211. ISBN 978-2-7420-0775-2. ^ a b Wood, Margaret E. (June 3, 2016). "Biting Back". Chemical Heritage Magazine. 28 (2): 7. Retrieved March 20, 2018. ^ Hook, Sue Vander (2011). Louis Pasteur: Groundbreaking Chemist & Biologist. p. 8. ISBN 978-1-61714-783-8. ^ Corole D, Bos (2014). "Louis Pasteur and the Rabies Virus – Louis Pasteur Meets Joseph Meister". Awesome Stories. Retrieved November 22, 2014. ^ a b c d e f Wasik, Bill; Murphy, Monica (2013). Rabid: A Cultural History of the World's Most Diabolical Virus. New York: Penguin Books. ISBN 978-1-101-58374-6. ^ a b c d e f Jackson, Alan C., ed. (2013). Rabies: Scientific Basis of the Disease and Its Management (3rd ed.). Amsterdam: Academic Press. pp. 3–6. ISBN 978-0-12-397230-9. ^ a b Trueman C. "Louis Pasteur". HistoryLearningSite.co.uk. Retrieved July 3, 2013. ^ Artenstein, Andrew W., ed. (2009). Vaccines: A Biography. Springer. p. 79. ISBN 978-1-4419-1108-7. ^ Munthe, Axel (2010) [First published 1929]. "V: Patients". The Story of San Michele. Hachette UK. ISBN 978-1-84854-526-7. ^ Geison, Gerald L. (2014). The Private Science of Louis Pasteur. Princeton University Press. p. 3. ISBN 978-1-4008-6408-9. ^ Altman, Lawrence K (1995). "Revisionist history sees Pasteur as liar who stole rival's ideas". The New York Times on the Web. 16: C1, C3. PMID 11647062. ^ Debré, Patrice (2000). Louis Pasteur. Baltimore: Johns Hopkins University Press. ISBN 978-0-8018-6529-9. ^ Kauffman, George B (1999). "Book Review: Louis, Louis, Louis". American Scientist. Retrieved October 27, 2014. ^ Béchamp, A (1855). "Note sur l'influence que l'eau pure et certaines dissolutions salines exercent sur le sucre de canne". Comptes Rendus Chimie. 40: 436–438. ^ Béchamp, A (1858). "De l'influence que l'eau pur ou chargée de diverse sels exerce à froid sur the sucre de canne". Comptes Rendus Chimie. 46: 4–47. ^ Cadeddu, A (2000). "The heuristic function of 'error' in the scientific methodology of Louis Pasteur: the case of the silkworm diseases". History and Philosophy of the Life Sciences. 22 (1): 3–28. PMID 11258099. ^ Manchester KL (2001). "Antoine Béchamp: pere de la biologie. Oui ou non?". Endeavour. 25 (2): 68–73. doi:10.1016/S0160-9327(00)01361-2. PMID 11484677. ^ Anonymous (1908). "Obituary: Professor Bechamp". The British Medical Journal. 1 (2471): 1150. doi:10.1136/bmj.1.2471.1150-b. PMC 2436492. ^ Windelspecht, Michael (2003). Groundbreaking Scientific Experiments, Inventions, and Discoveries of the 19th Century. Westport: Greenwood Publishing Group. p. 100. ISBN 978-0-313-31969-3. ^ Dworkin, Martin; Falkow, Stanley; Rosenberg, Eugene; Schleifer, Karl-Heinz; Stackebrandt, Erko, eds. (2006). The Prokaryotes: Vol. 1: Symbiotic Associations, Biotechnology, Applied Microbiology. Springer. pp. 285–286. ISBN 978-0-387-25476-0. ^ Swabe, Joanna (2002). Animals, Disease and Human Society: Human-animal Relations and the Rise of Veterinary Medicine. Routledge. p. 83. ISBN 978-1-134-67540-1. ^ Jones, Susan D. (2010). Death in a Small Package: A Short History of Anthrax. JHU Press. p. 69. ISBN 978-1-4214-0252-9. ^ a b Chevallier-Jussiau, N (2010). "[Henry Toussaint and Louis Pasteur. Rivalry over a vaccine]" (PDF). Histoire des Sciences Medicales. 44 (1): 55–64. PMID 20527335. ^ Williams, E (2010). "The forgotten giants behind Louis Pasteur: contributions by the veterinarians Toussaint and Galtier". Veterinary Heritage : Bulletin of the American Veterinary History Society. 33 (2): 33–39. PMID 21466009. ^ Flower, Darren R. (2008). Bioinformatics for Vaccinology. Chichester: John Wiley & Sons. p. 31. ISBN 978-0-470-69982-9. ^ Geison, Gerald L. (1990). "Pasteur, Roux, and Rabies: Scientific Clinical Mentalities". Journal of the History of Medicine and Allied Sciences. 45 (3): 341–365. doi:10.1093/jhmas/45.3.341. PMID 2212608. ^ Forster, Patrice Debré ; translated by Elborg (2000). Louis Pasteur (Johns Hopkins pbk. ed.). Baltimore: Johns Hopkins University Press. pp. 455–456. ISBN 978-0-8018-6529-9. ^ Gelfand, T (2002). "11 January 1887, the day medicine changed: Joseph Grancher's defense of Pasteur's treatment for rabies". Bulletin of the History of Medicine. 76 (4): 698–718. doi:10.1353/bhm.2002.0176. PMID 12446976. ^ Murphy, Timothy F. (2004). Case Studies in Biomedical Research Ethics. Cambridge: MIT Press. p. 83. ISBN 978-0-262-63286-7. ^ Geison, GL (1978). "Pasteur's work on rabies: reexamining the ethical issues". The Hastings Center Report. 8 (2): 26–33. doi:10.2307/3560403. JSTOR 3560403. PMID 348641. ^ Hoenig, Leonard J. (1986). "Triumph and controversy. Pasteur's preventive treatment of rabies as reported in JAMA". Archives of Neurology. 43 (4): 397–399. doi:10.1001/archneur.1986.00520040075024. PMID 3513741. ^ Debré, Patrice (2000). Louis Pasteur. Translated by Forster, Elborg. Baltimore: JHU Press. p. 503. ISBN 978-0-8018-6529-9. ^ Lord Wrottesley (1856). "[Address Delivered before the Royal Society]". Proceedings of the Royal Society of London. 8: 254–257. doi:10.1098/rspl.1856.0067. ^ "Anniversary Meeting". Proceedings of the Royal Society of London. 23 (156–163): 68–70. 1874. doi:10.1098/rspl.1874.0007. ^ Manchester, Keith (2001). "Exploding the Pasteurian legend". Endeavour. 25 (4): 148–152. doi:10.1016/S0160-9327(00)01389-2. Also Manchester K (2001). "Exploding the Pasteurian legend". Trends Biochem. Sci. 26 (10): 632–636. doi:10.1016/s0968-0004(01)01909-0. PMID 11590017. ^ Keim, Albert; Lumet, Louis (1914). Louis Pasteur. Frederick A. Stokes Company. pp. 50–51, 69. ^ "Biographie". Maison de Louis Pasteur (in French). Retrieved February 13, 2017. ^ Vallery-Radot, René (1919). The Life of Pasteur. Translated by Devonshire, R. L. London: Constable & Company. p. 225. ^ Debré, Patrice (2000). Louis Pasteur. Translated by Forster, Elborg. Baltimore: JHU Press. p. 508. ISBN 978-0-8018-6529-9. ^ Debré, Patrice (2000). Louis Pasteur. Translated by Forster, Elborg. Baltimore: JHU Press. p. 509. ISBN 978-0-8018-6529-9. ^ a b Frankland, Percy; Frankland, Percy (1901). Pasteur. Cassell and Company. p. 211. ^ "Louis Pasteur (1822 - 1895)". Royal Netherlands Academy of Arts and Sciences. Retrieved July 19, 2015. ^ Sevan Nişanyan: Yanlış Cumhuriyet İstanbul: Kırmızı Yayınları 2009, S. 263. ^ "Leeuwenhoek Medal". Royal Netherlands Academy of Arts and Sciences. Retrieved February 7, 2017. ^ "Louis Pasteur". Grande chancellerie de la Légion d'honneur (in French). Retrieved February 7, 2017. ^ "Louis Pasteur, (sculpture)". Save Outdoor Sculpture!. Smithsonian American Art Museum. Retrieved May 12, 2012. ^ "Louis Pasteur (1822-1895)". UNESCO. Retrieved January 21, 2018. ^ Vallery-Radot, René (1919). The Life of Pasteur. Translated by Devonshire, R. L. London: Constable & Company. p. 428. ^ "Institut Pasteur International Network". pasteur-international.org. Retrieved July 3, 2013. ^ Pasteur Vallery-Radot, Letter to Paul Dupuy, 1939, quoted by Hilaire Cuny, Pasteur et le mystère de la vie, Paris, Seghers, 1963, pp. 53–54. Patrice Pinet, Pasteur et la philosophie, Paris, 2005, pp. 134–135, quotes analogous assertions of Pasteur Vallery-Radot, with references to Pasteur Vallery-Radot, Pasteur inconnu, p. 232, and André George, Pasteur, Paris, 1958, p. 187. According to Maurice Vallery-Radot (Pasteur, 1994, p. 378), the false quotation appeared for the first time in the Semaine religieuse ... du diocèse de Versailles, October 6, 1895, p. 153, shortly after the death of Pasteur. ^ Vallery-Radot, Maurice (1994). Pasteur. Paris: Perrin. pp. 377–407. ^ Pasteur Vallery-Radot, Letter to Paul Dupuy, 1939, quoted by Hilaire Cuny, Pasteur et le mystère de la vie, Paris, Seghers, 1963, pp. 53–54. ^ Pasteur, 1994, p. 378. ^ In Pasteur's Semaine religieuse ... du diocèse de Versailles, October 6, 1895, p. 153. ^ Joseph McCabe (1945). A Biographical Dictionary of Ancient, Medieval, and Modern Freethinkers. Haldeman-Julius Publications. Retrieved August 11, 2012. The anonymous Catholic author quotes as his authority the standard biography by Vallery-Radot, yet this describes Pasteur as a freethinker; and this is confirmed in the preface to the English translation by Sir W. Osler, who knew Pasteur personally. Vallery-Radot was himself a Catholic yet admits that Pasteur believed only in "an Infinite" and "hoped" for a future life. Pasteur publicly stated this himself in his Academy speech in 1822 (in V.R.). He said: "The idea of God is a form of the idea of the Infinite whether it is called Brahma, Allah, Jehova, or Jesus." The biographer says that in his last days he turned to the Church but the only "evidence" he gives is that he liked to read the life of St. Vincent de Paul, and he admits that he did not receive the sacraments at death. Relatives put rosary beads in his hands, and the Catholic Encyclopedia claims him as a Catholic in virtue of the fact and of an anonymous and inconclusive statement about him. Wheeler says in his Dictionary of Freethinkers that in his prime Pasteur was Vice-President of the British Secular (Atheist) Union; and Wheeler was the chief Secularist writer of the time. The evidence is overwhelming. Yet the Catholic scientist Sir Bertram Windle assures his readers that "no person who knows anything about him can doubt the sincerity of his attachment to the Catholic Church," and all Catholic writers use much the same scandalous language. ^ Patrice Debré (2000). Louis Pasteur. JHU Press. p. 176. ISBN 978-0-8018-6529-9. Does this mean that Pasteur was bound to a religious ideal? His attitude was that of a believer, not of a sectarian. One of his most brilliant disciples, Elie Metchnikoff, was to attest that he spoke of religion only in general terms. In fact, Pasteur evaded the question by claiming quite simply that religion has no more place in science than science has in religion. ... A biologist more than a chemist, a spiritual more than a religious man, Pasteur was held back only by the lack of more powerful technical means and therefore had to limit himself to identifying germs and explaining their generation. ^ Debré, Patrice (2000). Louis Pasteur. Translated by Forster, Elborg. JHU Press. p. 368. ISBN 978-0-8018-6529-9. Pasteur advocated separation of science and religion: "In each one of us there are two men, the scientist and the man of faith or of doubt. These two spheres are separate, and woe to those who want to make them encroach upon one another in the present state of our knowledge!" ^ Patrice Debré (2000). Louis Pasteur. JHU Press. p. 176. ISBN 978-0-8018-6529-9. ^ Vallery-Radot, René (1919). The Life of Pasteur. Translated by Devonshire, R. L. London: Constable & Company. pp. 159–168. ^ Debré, Patrice (2000). Louis Pasteur. Translated by Forster, Elborg. Baltimore: JHU Press. p. 512. ISBN 978-0-8018-6529-9. ^ Keim, Albert; Lumet, Louis (1914). Louis Pasteur. Frederick A. Stokes Company. p. 206. ^ Vallery-Radot, René (1919). The Life of Pasteur. Translated by Devonshire, R. L. London: Constable & Company. p. 458. ^ Frankland, Percy; Frankland, Percy (1901). Pasteur. Cassell and Company. pp. 217–219. ^ Campbell, D M (January 1915). "The Pasteur Institute of Paris". American Journal of Veterinary Medicine. 10 (1): 29–31. Retrieved February 8, 2010. Debré, P.; E. Forster (1998). Louis Pasteur. Baltimore, MD: Johns Hopkins University Press. ISBN 978-0-8018-5808-6. Duclaux, E.Translated by Erwin F. Smith and Florence Hedges (1920). Louis Pasteur: The History of a Mind. Philadelphia, Pennsylvania: W.B. Saunders Company. ASIN B001RV90WA. Geison, Gerald L. (1995). The Private Science of Louis Pasteur. Princeton, NJ: Princeton University Press. ISBN 978-0-691-03442-3. Williams, Roger L. (1957). Gaslight and Shadow: The World of Napoleon III, 1851–1870. New York: Macmillan Company. ISBN 978-0-8371-9821-7. Wikimedia Commons has media related to Louis Pasteur. This page was last edited on 7 April 2019, at 00:14 (UTC).